Anon... I was thinking the same thing :-) As usual, David's video offers a look at what's possible when we plan communities for active transportation. I'd like to live in such a place. That's only going to happen if I work to make Springfield a more bicycle-friendly town. @ Anonymous, there are three possible reasons for the lack of hats, one, Dutch people are just tough, two, it wasn't actually that cold, or three, cycling warms you up (exercise remember?). I certainly start with wearing a hat, ear warmers, gloves and a shawl. After half an hour I am usually only wearing the shawl. 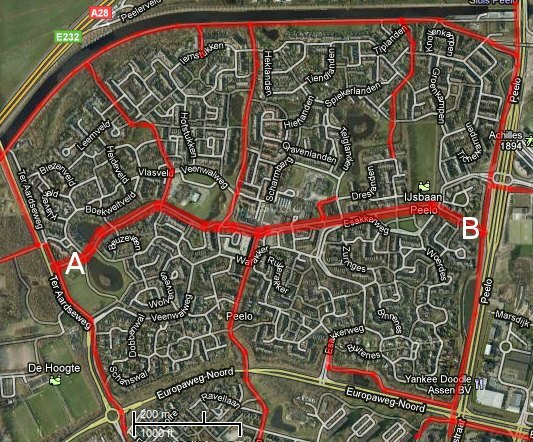 I'm surprised at the low density of housing in Peelo - it's lower than a lot of the US, yet cycling is practical!